O.K. I admit that my site has become "Dartfrog's Adventures in the Seven Year's War" of late, but at least I am making some serious progress. January is officially a combined arms month for Prussia here in The Den with the completion of the Artillery component for my army. 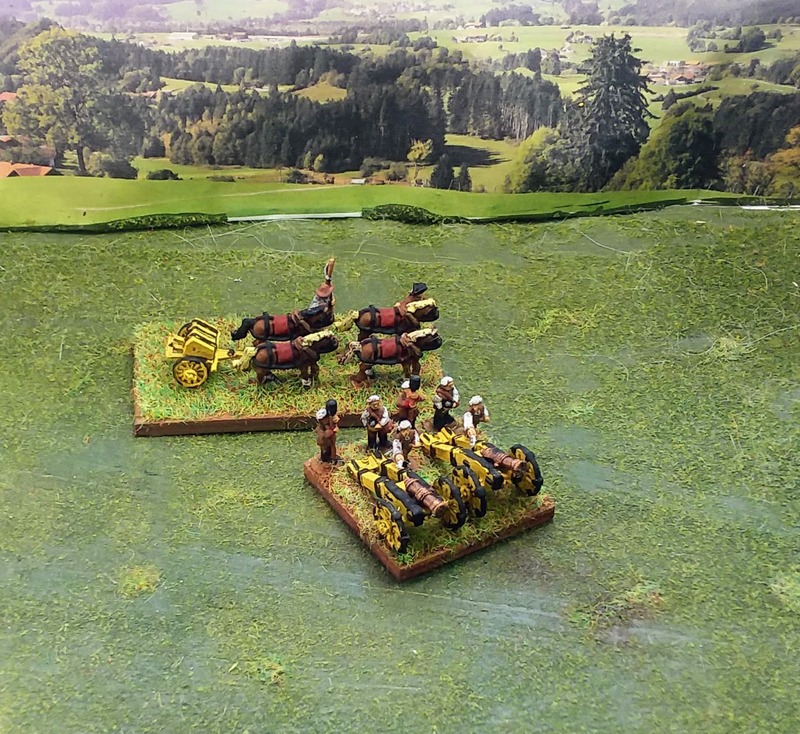 I picked up two packs of Heavy Cannon and two packs of Howitzers from Pendraken's Prussian SYW line that allowed me to add one more stand each of heavy guns and howitzers, and also enough limbers to equip all 9 batteries in the collection. The heavy guns are significantly larger than their old glory counterparts necessitating a slightly larger stand that still barely contains both pieces. 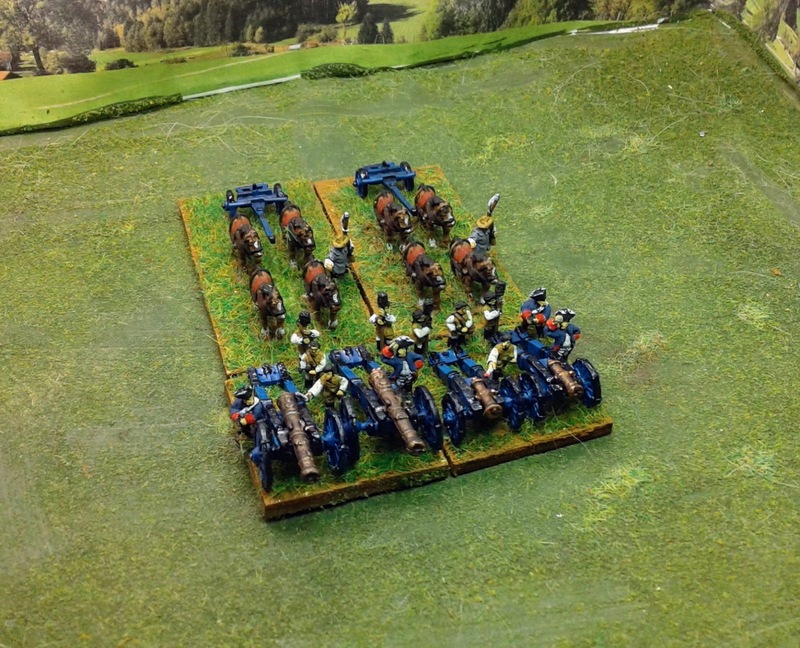 The barrel is more detailed, although the gun carriages are comparable. Comparing the two side by side shows a definite difference in scale. I already have three stands of the Old Glory guns, so I will probably use the Pendraken battery to represent the larger 24lb guns present in some historical engagements. 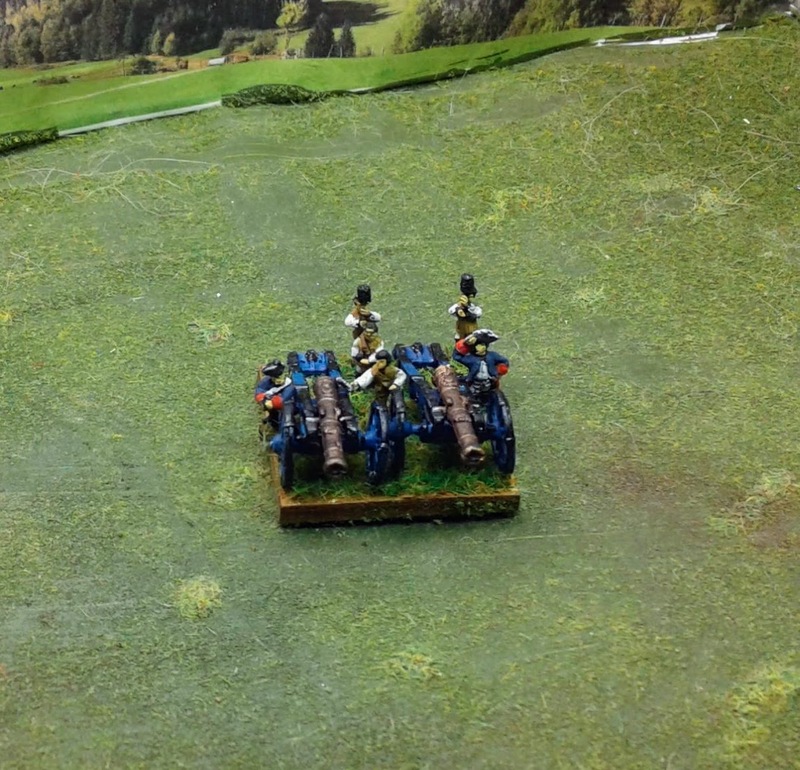 The howitzers are the same as the previous stand. There is no comparable gun from Old Glory, this brings the total up to two batteries, which should be sufficient for my gaming needs. 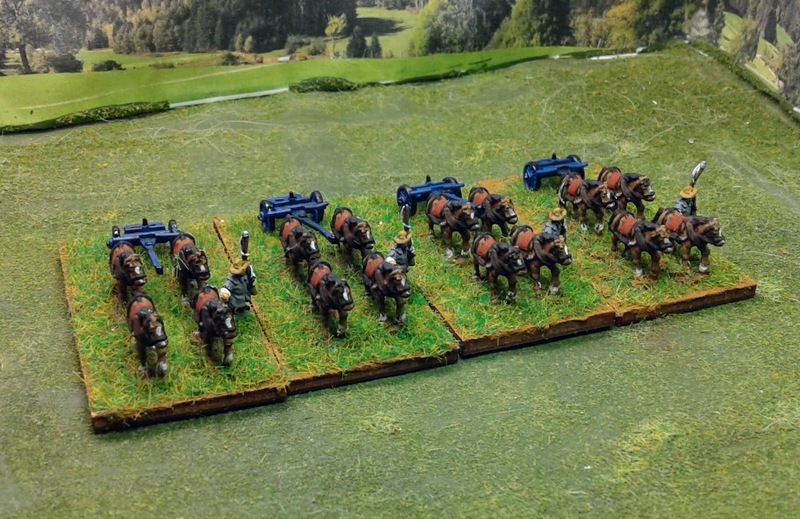 Pendraken artillery packs come with a gun, six crew and a four horse limber team. Old Glory sells their guns in 12 packs of light, medium or heavy cannon with crewman in separate packs of 50. That basically means that I have enough leftover crew between these packs and the Austrian packs I picked up to equip another three batteries for each side if I decide to buy another cannon pack from Old Glory. 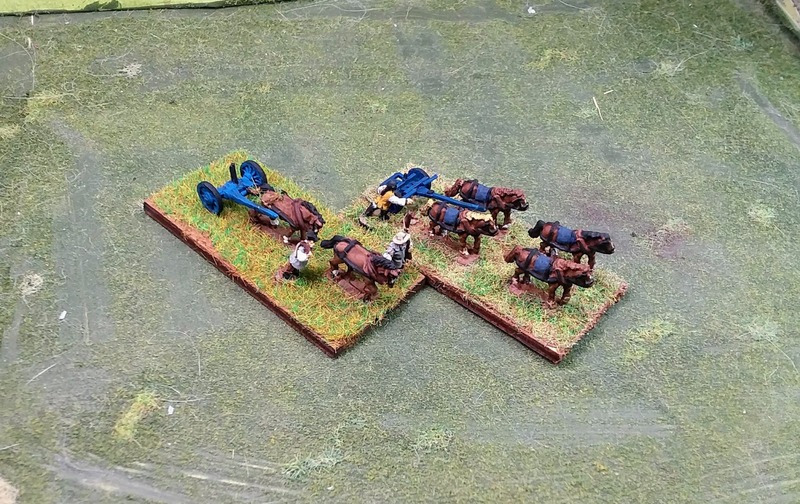 Pendraken's Limber teams are quite nice with four horses and a tender for each team. Unlike the guns, I don't double up the bases, so I had two teams to spare to equipment my Old Glory Guns. 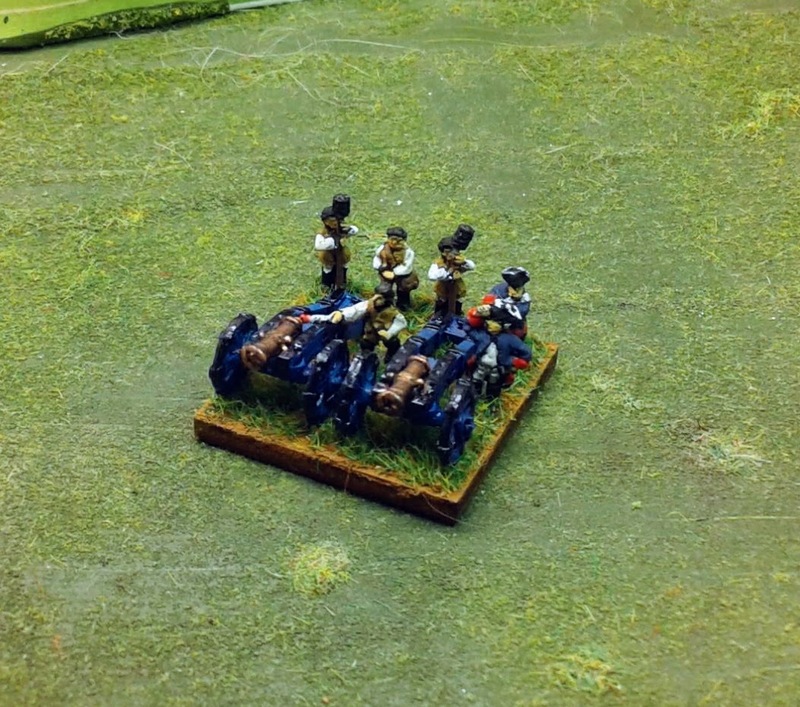 That brings the Prussian side up to 2 Howitzers, 4 Heavy Guns and 3 Medium guns for now. 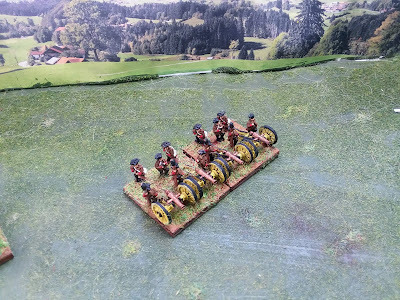 I have the same four packs for the Austrian side to complete, then I should have my artillery contingents for this project done. Looks like a good time for a manufacturers comparison on artillery. 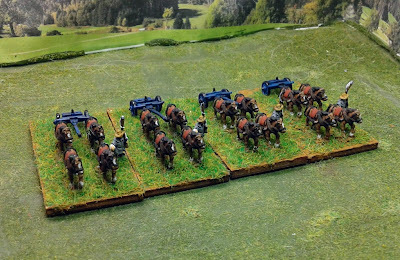 I have previously done this for the Infantry and Cavalry, so I will follow the same general pattern. Organization: I am currently basing my artillery with two guns and six crew on a 30mm square base representing a single battery of 6-8 guns. 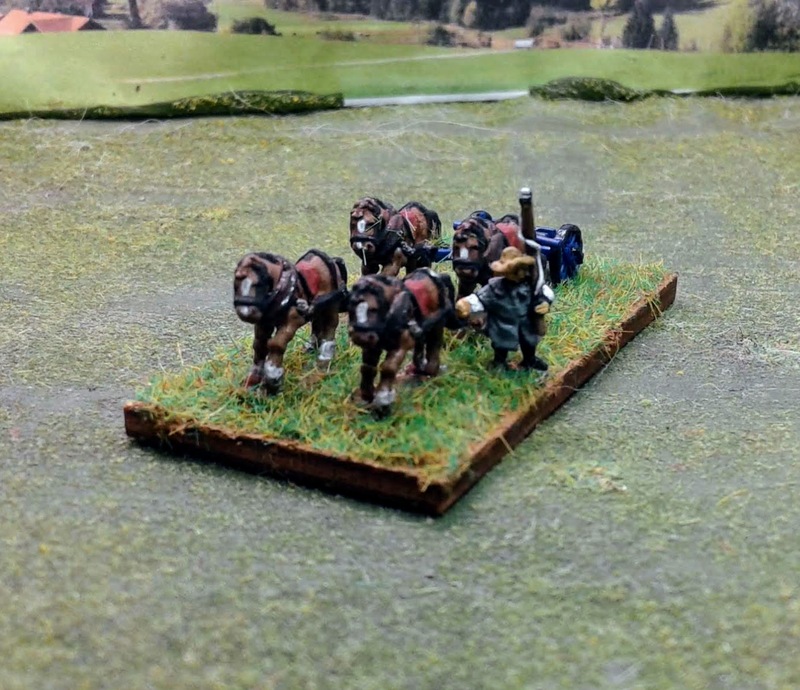 I also include one limber team on a 30mmx60mm base per gun to represent when the team is in motion or placed behind the battery to represent the artillery's logistical 'footprint' on the table. The guns represent a single type of either light (3lb), medium (6-8l or heavy (12+lb) guns, or howitzers. Old Glory: Old Glory sells artillery in packs of 12 guns with crew sold in separate packs of 50 each. The available packs are Austrian Light, Medium and Heavy Guns as well as Prussian Medium and Heavy Guns. These retail at $17USD a pack or $10.20 if you have the "Old Glory Army" subscription for $50 per year. There are two crew packs with 50 figures each for $10.50 ($6.30) That puts my per unit cost at $2.45 ($4 w/o the discount) Old Glory currently charges a flat $9 shipping fee for orders in the US. Pendraken: Pendraken has a much larger variety of guns with a normal pack including 1 gun w/carriage, six crew, and an artillery limber with 4 horses and single crewman for roughly $5.50 US at the current exchange rate. 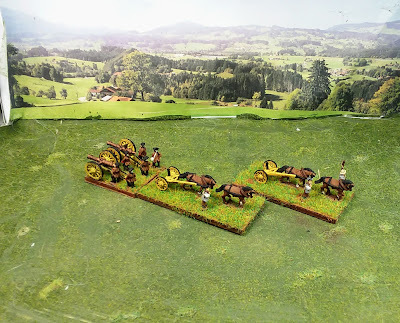 (Pendraken also charges a 25% postage fee for orders to the US) It is a little more difficult to articulate my per unit cost as I get 1 battery and 2 limber teams for $11.00 compared to $7.85 ($13 w/o discount) for a similar deal for Old Glory. 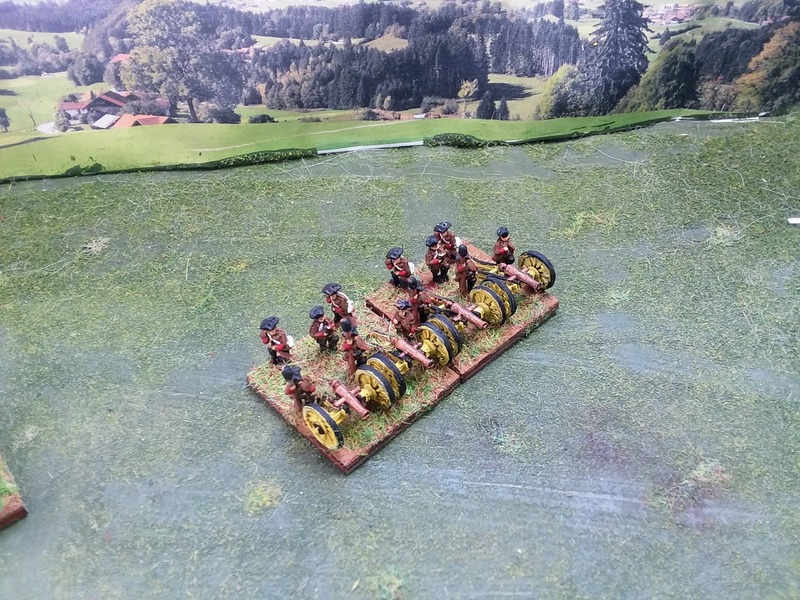 The Pendraken 3pdrs are sold in packs of three guns with 18 crew. Costs: No clear choice. Old Glory comes out significantly ahead on the per battery price for the guns, but less so when you compare the limbers. Economy: Old Glory . The additional crewman for the Pendraken packs really don't do much for me but increase the amount of extra figures in the pile. I have converted some to add additional crew to my limber teams, but for the most part they are serving as the crewman for additional guns from Old Glory. In fact I currently buy just gun packs from Old Glory and crew them with my leftover Pendraken crewmen. This also gives me something to do with the extra limbers I end up with as I always do two guns on a stand. Sculpts: Pendraken. The Pendraken crew figures still tend to run a little thicker, but I have little trouble mixing them on the same base. Their cannons and carriages also tend to be more stocky. Where Pendraken really comes out ahead is with the limbers. The models are more detailed and have more heft then the Old Glory AWI models. Variety: Pendraken. Pendraken wins big here with the shear volume of guns available. 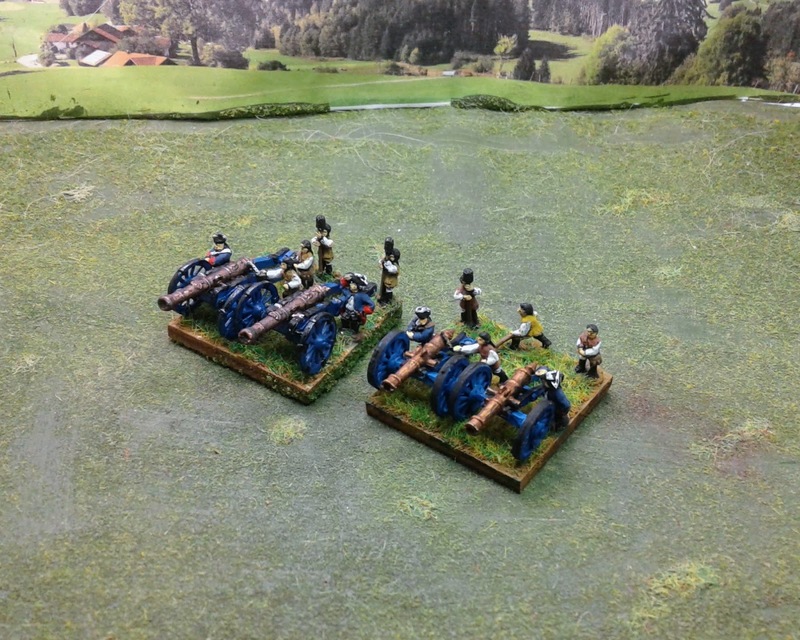 There are fortress guns, howitzers and even different limber models for the Prussians and the Austrians. The pounds current recovery against the pound (back over a 1.30 last time I checked.) means that Pendraken is still a fairly good buy even with the 25% added charge for postage. 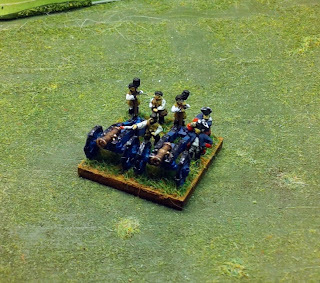 The artillery really does stand up well to comparison where I am normally leaning towards Old Glory for my Cavalry and Infantry units. I guess I can do a review of the command figures at some point, but otherwise I have now covered the major areas for consideration if you are thinking about buying 10mm SYW figs here in the US. Wow, most impressive and beautiful guns! You are making serious progress, indeed! Batteries and limbers both! The barrels on those heavy guns are... huge! They look the part, though. Interesting price, etc analysis on these two 10 mm options!